Crissy Field is a stunning park site within the Golden Gate National Parks. Crissy Field’s 100 acres of wild, windswept shoreline are a favorite place for walkers, joggers, boardsailors, bicyclists, thousands of birds and the occasional seal. Originally a rich salt marsh and gathering ground for native people, Crissy Field was later the landing site of Spanish explorers and Russian, English and Boston traders. In 1915, the Panama Pacific International Exposition was held here, and shortly after, the area became one of the country’s foremost military airfields and part of a U.S. army post. With generous community support, Crissy Field has been transformed into a spectacular national parkland. 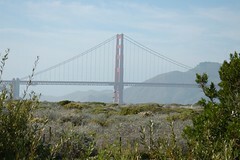 The 100-acre site is included within the Golden Gate National Recreation Area and the Presidio of San Francisco. Along with the entire Presidio, it was designated a National Historic Landmark in 1962. 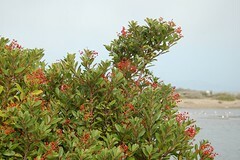 As part of the site restoration effort in 1998-2000, individuals and groups from schools, corporations and civic organizations put in more than 100,000 native plants to help restore natural systems at Crissy Field. Community volunteers continue to play an important role in sustaining long-term stewardship of this national parkland. Special thanks to Charity Maybury and Kristen Ward at The Crissy Field Center for their participation in this Exploration. With a view of the Golden Gate bridge, Crissy Field is a fine example of preserving nature in an urban environment. Along the northern edge of the San Francisco peninsula is a 100-acre park with a storied past. Crissy Field is a recently restored section of the Presidio in the Golden Gate National Recreation Area. It stretches from the foot of the Golden Gate bridge to the city’s Marina District, granting public beach access along much of the bay inlet known as the Golden Gate and providing walking trails along which visitors can admire native plants, watch for birds, or just sit and marvel at the view. Crissy Field hasn’t always looked like this. Change is a constant here. Along the beach, waves continually deposit sand and wash away footprints. Return a week after your last visit and the tides will have shifted the sandbar’s shape and carved new curves into the dunes. Even larger changes take place over longer periods of time, making this recently re-created urban shoreline an illustration of how dynamic living systems can be. The abundance of plant life and waterfowl belie Crissy Field’s previous life as a military post and airfield. Humans and nature both contribute to the shifts in Crissy Field’s landscape and environment. An oil spill in November 2007 may be one of the most recent human-caused events to affect the area, but it certainly isn’t the largest or most damaging. Crissy Field has had many previous incarnations. Before it became a Spanish military post in 1776, the native Ohlone people took advantage of the area’s abundance of plant and animal life. In 1848, the site became a U.S. military post, and an airfield was added in 1921. During the Vietnam war, this airfield was a landing spot for wounded soldiers being transported from Travis Air Force Base northeast of San Francisco to Letterman Hospital. The airfield closed to fixed-wing aircraft in 1974, but continued as a U.S. Army post until the National Park Service assumed management in 1994. Three years later, planners began to recreate Crissy Field back to its pre-military state. By the time the new park was completed in 2000, over 3000 volunteers had planted 100,000 native plants in the dunes, where they’ve flourished. Nowadays a visitor would be hard pressed to imagine the area under blacktop, surrounded by airline hangars. Today, the park claims 130 documented species of birds and 105 species of plants. The original salt marsh, which drew Native Americans here before the area was developed, has been restored, along with a small plot of freshwater habitat called dune swale. With its tall grasses and occasional cattails, dune swale was once a very common environment in the area now occupied by San Francisco. 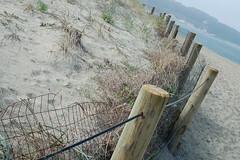 Fences around Crissy Field’s beach dunes often need to be rebuilt as wind, waves, and human interactions reshape the sands. Observing Crissy Field as a protected area now, its Park Ranger caretakers can point out how nature exerts its own dramatic changes here. Some animal populations come and go as the seasons change. Wind and waves are forever rearranging the shoreline, shifting the sands and shaping the plant communities. Occasionally, the surf deposits enough sand on the shore to close off the inlet to the park’s salt marsh, which rangers then have to dredge to reopen. Near the beach, wind and water (and the occasional canine friend of humans) combine to reshape the dunes, leaving them in need of ever-new fences to protect them from these elements. At Crissy Field, park planners and rangers must strike a delicate balance between preservation and recreation. Human efforts have both assaulted this shoreline and helped it recover. Nature has its hand in healing as well, the terrain’s capacity for change lending it resilience. Now paths and beaches provide opportunity for visitors to appreciate how the two forces can work together to revive a landscape that once seemed lost. There are many kinds of volunteering opportunities at Crissy Field and in other parts of the Golden Gate National Recreation Area. Volunteers help with habitat restoration, wildlife protection and monitoring, maintaining native plant nurseries, seed collecting and invasive plant control. On the ground, this can mean planting, cutting, counting, observing and collecting. Call (415)561-3034 x3429 / TTY (415)561-3020 to talk to someone about what volunteering activity would best suit your interests and schedule. For volunteering in other parts of the GGNRA, call the volunteer hotline number at (415) 561-4755. Join the Crissy Field photo group on Flickr to share your photos of this amazing place. Prev Winds of change: the climate of the solar system Next Mollusk Madness: can we collect shells responsibly?